Missouri water and wastewater utilities. Free o­n-site assistance from operators with years of actual experience, everything from Aerators to Zeolite Softening. An ounce of prevention is worth a pound of cure, and MRWA can help you prepare a sourcewater protection plan, whether you have wells or use surface water, to help protect the quality of your drinking water source and your community’s health and well-being. Using satellite based global positioning technology, MRWA Mapping Technicians can produce and provide a detailed set of maps to your utility. If your system is lacking a certified operator or you have questions about obtaining certification, our Water Training Specialist or Management Circuit Rider can assist your system. MRWA created the Certified Office Professional Program (COPP) in order to recognize the importance of office and managerial activities in the water industry as well as to give those individuals working in the Office Professional fields an opportunity to nurture and demonstrate their knowledge and professionalism. To download the manual, look for it in the MRWA Download Center under the Certified Office Professional Forms tab. If you have questions about COPP, contact Liz Grove at egrove@moruralwater.org or 573-231-6797. Free o­n-site assistance with your wastewater system problems whether you have a lagoon system or a mechanical plant. Specializing in “real life” solutions. Smoke Testing Assistance is also a part of our on-site wastewater service. This service helps to locate points where water is entering your wastewater collection system, commonly referred to as Inflow and Infiltration, or I and I problems. MRWA Resource Conservation Circuit Rider, and Drinking Water Circuit Riders, use years of experience and the latest in technology to assist you in accounting for every drop of water. MRWA will assess your energy consumption, major energy consuming equipment and facilities and outline potential energy costs saving possibilities. Contact Mark Klaus at mklaus@moruralwater.org or at 816-349-2670. MRWA offers a steady supply of training all over the state, all year long. Not only do we provide common needs training, we can also create customized training specifically for your system or group. We ensure that our training meets Missouri requirements for Renewal Credit Hours through the Department of Natural Resources, as well as provide hours for the Certified Office Professional Program, Water District Board Certification, and training suitable for Professional Engineer renewal. If you wish to request Drinking Water or Distribution training, or wish to offer your location as a training site, contact: Tom Hyatt at thyatt@moruralwater.org or 573-783-1745. If you wish to request Waste Water training, or wish to offer your location as a training site, contact: Donald Jones at djones@moruralwater.org or 573-359-8801. Likewise, if you have questions about subjects such as Sunshine Law, Rate Studies, managerial issues, record keeping, or questions regarding clerks, collectors, and other office professionals, or would like to inquire about training on these subjects, contact: Liz Grove at egrove@moruralwater.org or 573-231-6797. We are always taking nominations for the above awards. If you would like to nominate a system or system employee for an award, you can find the nomination form HERE. If you have any questions about the awards, contact Eric Fuchs at efuchs@moruralwater.org or 573-429-1383. We provide this free service to you with two intentions: First, we use it to remind you when your area has bad weather coming. For example, should your area be issued a Winter Storm Warning, we’ll remind you to check your generator, fuel levels, make sure your tower is full, etc. Second, we’ll let you know when a class is nearby so you don’t miss a single opportunity for training. We’ll send you a text when it’s important; we will not pester you with a lot of junk. Even though this is a free service, you must be sure if your calling plan allows you to receive text messages. These are incoming messages only; you can NOT respond to MRWA Text Alerts. Even though you may have to pay a few cents for an incoming text, these reminders are priceless! Click HERE to sign up for free MRWA Text Alerts. MRWA has been collecting information o­n system salaries and benefits for more than a decade. Find out what we know about salary trends in the industry. As well, in alternating years we provide a survey of water and wastewater rates, including various fees, from all over Missouri. Look for these in the MRWA download center under the Annual Survey tab. The Missouri Rural Water Association Scholarship Committee will award four (4) college scholarships for the 2019-2020 school term. Two scholarships will be awarded to enrolled college students and two awarded to graduating high school seniors. The scholarships will be awarded to children, stepchildren or dependents of a full-time employee of either an Active Member System or of MRWA. The two scholarships awarded to enrolled college students are designated the James Farley Scholarship in honor and memory of James Farley, a longtime attorney in the water industry. Mr. Farley was instrumental in drafting many of the laws which govern rural water districts in the State of Missouri and was legal counsel for many water districts which were formed in Northwest Missouri. He was a longtime supporter of MRWA, dating back to the beginning of the Association, and served as legal counsel for MRWA from 2000 until he retired from practicing law in 2014. Mr. Farley passed away in April 2015. Click here for complete application and rules. Questions? Contact Crystal Cooper at ccooper@moruralwater.org or by calling 800-232-6792. Session schedules, Exhibit Hall Layouts, Scavenger Hunt Clues, and Conference Evaluation/Surveys always at arm’s length. Click below on your app store to download the MRWA Conference App today. Protecting our drinking water sources, and our wastewater system integrity, is paramount to our mission. Unwanted pharmaceuticals are thrown away and flushed away and are beginning to show up in trace amounts in our water supplies. Drug Take-Back Events allow you the opportunity to offer your community to bring their unwanted pharmaceuticals to a drop-off point and dispose of them properly. The National Drug-Take Back event occurs on the last Saturday of April and October. Contact MRWA at 573-657-5533 for more information. ServLine is a new and unique insurance program that covers water loss with no deductible, as well as repairs or replacement of a customer’s water and sewer line in a timely fashion. ServLine is a full service program backed by Hanover Insurance Company – not a warranty program. The difference is that warranty programs only cover water line and sewer line repairs, and don’t provide leak adjustments for the utility and the customer. Contact Randy Norden, MRWA Executive Director, at 573-657-5533 for more information about this program. Contact Randy Norden, MRWA Executive Director, at 573-657-5533 for more information about this program, or have your system’s insurance agent contact Bailey Special Risks to obtain a quote. Rates are affordable and backed by a Best “A” Rated insurance underwriter, with 25 years of experience and licensed in all 50 states. A benefit for MRWA members! Save thousands of dollars on your next purchase of a Ford vehicle, whether you buy one or a fleet! Contact the MRWA office to verify membership and receive your code. Once you have the code, the visit this site to begin shopping or visit any Ford dealership. You can contact the MRWA office at 800-232-6792. Public entities, such as water and wastewater systems must carry liability insurance. The Missouri Special Districts (MSDi) insurance program is a designed to provide you with high-quality coverage and service at a competitive price. In addition, the program pays back a portion of the money earned to MRWA. In turn, MRWA uses these funds to purchase equipment for MRWA that MRWA could not otherwise purchase. To date, this program has assisted MRWA in purchasing emergency response equipment, flow meters, and leak detection equipment. Ask YOUR agent to get a quote from MSDi on your next liability insurance renewal. It helps us, in return, help you. Rural Water Impact is the industry leader in professional, cost effective websites – custom designed for rural water systems. Rural Water Impact’s web solutions utilize tried-and-true principles of web design and usability standards, enabling water utilities to be more efficient, effective and professional in servicing their customers. Utilities benefit from a professional web presence as their site provides customers a greater level of information and service. This ultimately increases overall customer satisfaction and confidence in the utility. Contact Randy Norden, MRWA Executive Director, at 573-657-5533 for more information about this program. To learn more about the Lifestyle Health Plans solution for your group and take advantage of our exclusive National Rural Water Association Program rates, contact Randy Norden, MRWA Executive Director, at 573-657-5533 or contact Mike Keith Insurance at (800) 530-5229 or email Jeanie Cunningham at jeanie@mkeithins.com. 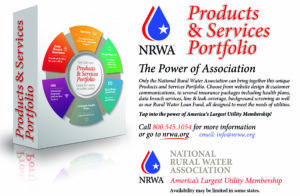 The National Rural Water Association and the Chrysler Group have created a partnership to offer a Volume Incentive Program (VIP) to State Rural Water Associations and their utility system members. This partnership combines the buying power of 31,000 individual utilities to provide reduced fleet pricing on utility vehicles. You will have access to special fleet benefits as a preferred Chrysler Group customer. The Rural Water Fleet Program is a valuable member benefit for water and wastewater utilities. Vehicles may be purchased at your local dealer or through the national fleet auto group, details are online at: www.nrwafleet.com or click the logo for more information. Incentive discount pricing is available on Jeep SUVs and Ram trucks. Systems can save up to $7,500 off factory invoice per vehicle.